In the autumn of 2014 I was happy to be among ten Chicago artists selected to participate in Herradura Tequila's Barrel Art project, wherein those creative individuals were each granted one soon-to-be repurposed 130 lb. tequila barrel and several weeks to transform that barrel into some art. A Machine for Essential Nothings was my offering, a reconstructed metaphor for cross-fermentation: Fully-mechanized with an illuminated core and indicator lights, the "machine" also came equipped with a motorized nucleus, the central source for a kinetic display of dancing globules that swirled, twirled, and bopped around its insides, like bubbles in a barrel. One of twenty Chicago artists chosen to be part of Red Bull's 2014 "Canvas Cooler" project, I was given one cooler wrapped in blank canvas and a single day to transform it into something neat. In the end I settled on an installed lighting system, complete with custom paint job and copper piping. Mine is the first cooler in Red Bull's ongoing spectacle - now in its 4th year running - to illuminate from all sides, triggered interactively via a toggle switch located up top. In the summer of 2012 I was contracted by the folks at Leo Burnett, who wanted me to turn an old mid-century refrigerator into an interactive piece of public art. Part of Com-Ed's ecologically-minded Metamorfridge project, I spent an entire month turning that beat up fridge into the Dream Engine, which was subsequently displayed along Chicago's Magnificent Mile. 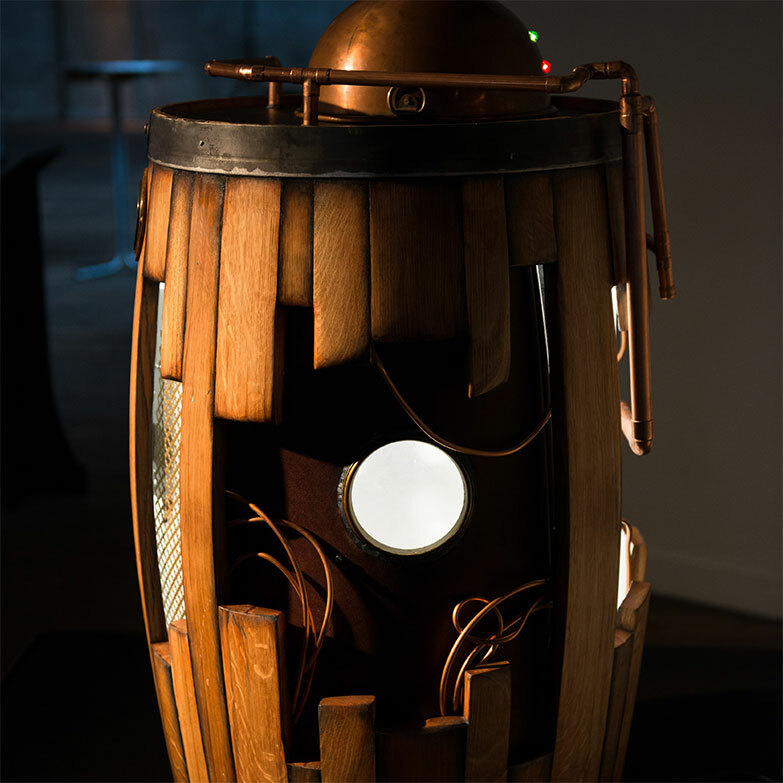 The Dream Engine was outfitted with several viewing apertures, one of which let pedestrians watch an animated sequence via the workings of an installed zoetrope - powered by the viewers themselves. As busy as Michigan Avenue remains after dark, late night tourists would not be left out - as the Dream Engine was illuminated internally by a solar-powered lighting system. * The Dream Engine now resides in the permanent collection of Exelon Corp in Joliet, IL. A promotional short film produced in conjunction with ComEd's Metamorfridge project.